DinVim is a version of Vim text editor for mac OS available in the Mac App Store. It is safe and secure working in the macOS sandbox environment. 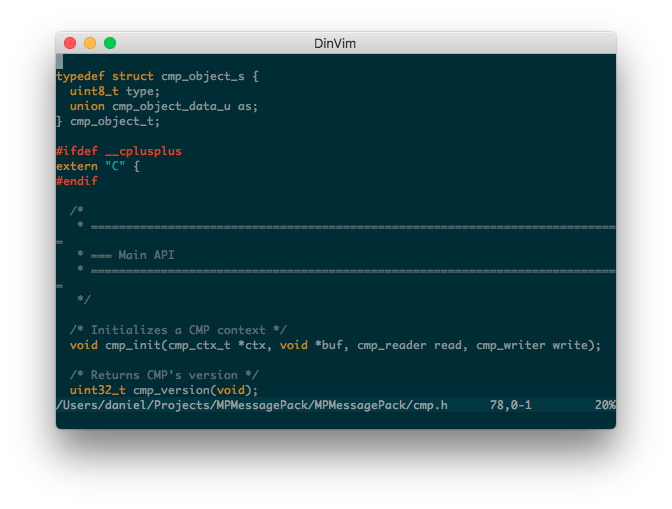 DinVim aims to provide true macOS experience for Vim users. Mac OS X 10.10 Yosemite or a newer macOS. Download on the App Store or search “DinVim” in the App Store Mac app. Click on a button with the price and follow instructions. Open DinVim from the Applications directory. Open Downloads directory in Finder. Double-click the file to decompress it if needed. Move the DinVim.app to the Applications directory. Confirm that you want to “Open” a downloaded application. Use right mouse click + “Open” in case of problems. Vim is a programmable text editor for the terminal. Because of its small size, fast startup time and portability, it has become a de facto standard terminal text editor for many Linux distributions as well as macOS. A command line version of Vim for mac OS is builtin into the OS distribution. For example git on macOS uses Vim by default to prompt for writing a commit message. Vim has a long history since 1990-s and a well-established fan base. It is known for stability, high backwards compatibility and ubiquity. Vim is highly customizable and extensible. Vim was historically a Unix terminal text editor without any graphical UI. Neovim is a software that makes possible embedding the Vim text editor engine as a part of a UI application, and provides connectivity between the UI and the Vim engine. Neovim brings modernization and improvements to the Vim extensibility side. DinVim uses Neovim to wrap the Vim engine into a native Vim for mac OS application.